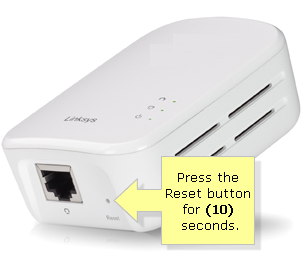 You need to reset your Linksys Powerline adapter if you want to restore the device to its factory default settings. IMPORTANT: Resetting your Powerline device to its factory defaults will delete its previous settings. Also, the devices connected to your second Powerline device will lose Internet connection once you perform a reset. NOTE: Make sure that your device is powered ON before performing the reset. Use a pin or any pointed object to press and hold the Reset button for 10 seconds. NOTE: The location of the Reset button may vary depending on the model of your device. In this example, we are using the Linksys PLE500. Its Reset button is located at the bottom of the device. Check the LEDs of your Powerline adapter. The LEDs of your device should blink. NOTE: To reconnect your computers or devices to access the Internet, press and hold the HomePlug Simple Connect button of your Powerline devices for at least one (1) second. The Powerline LEDs will start blinking and stabilize after a few seconds. Click the Linksys Powerline AV Utility icon. 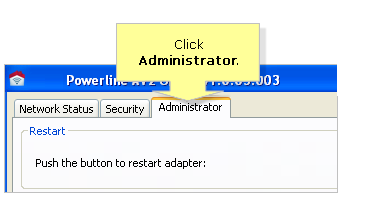 A notification window will appear on your screen informing you that the reset process of your Powerline Fast Ethernet Adapter will take a few minutes. 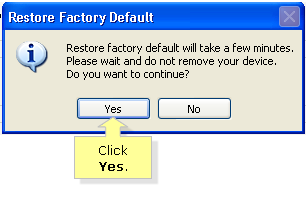 Click Yes to continue with the reset.